David Mitchell's Ghostwritten, which I recently reviewed2, referenced The Music of Chance repeatedly in the segment set in London. 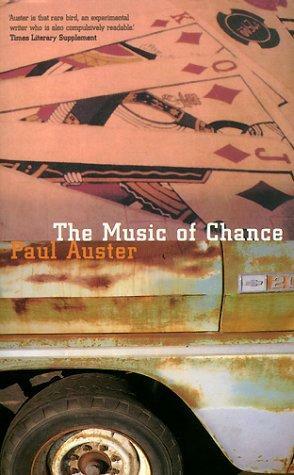 The protagonist of that section was in a band called "The Music of Chance", after "a novel by that New York bloke". This century being what it is, I Googled the novel, and within minutes it was on hold for me at the library down the street. Years of serious Wikipedia addition compel me to at least try to follow these links, but link networks get fatter as you traverse them, and time and attention become rarefied and dusty. However, following this link led me towards a rewarding reading experience of four Auster works in fairly short order3. The novel starts with Jim Nashe driving. Driving and driving. His wife has recently run off, and he has sent his young daughter to be raised by his sister. His estranged father has died, and left him with a modest fortune. After visiting his daughter, he finds himself compelled to drive. He leaves his job as a fireman, and simply starts driving. He drives for over a year, stopping along the way, periodically visiting his daughter and a woman he becomes attached to. The compulsion to drive eventually consumes his inheritance and he finds himself detached from everything but his daughter and sister. With his finances coming to an end, but his restless lust for driving unsatisfied, he happens upon Jack Pozzi, a young man who has obviously just been severely beaten. Pozzi is a semi-professional gambler with a "sure thing" lined up, but no financing. Nashe goes all in with his remaining cash, in the desperate hope of feeding his need to drive. The story comes to a climax during the "sure thing", a poker game with two lottery millionaires, but the climax is soon deflated as the story takes a sharp turn. Pozzi and Nashe lose more than everything to the millionaires, and become indentured servants, building the millionaires' folly — a wailing wall in a meadow made from imported stones from a long destroyed Irish castle. While Pozzi balks at the indignity, Nashe struggles with the task but sees it almost as an opportunity. With few connections in his life, and no vision for the future, the isolation and purpose of the folly appear to shift his inertia. But their situation is ambiguous and paranoia reasonably blooms. Are they employees, or slaves? Where they cheated? Will they ever be able to leave? In each section of the story, Auster allows tension to build, but then whips us down different paths before allowing the tension to resolve, and at a certain point in the story, I found myself getting physically anxious. Repeatedly the author appears to be accelerating towards a climax, but leaves the reader hanging. In the end there is no resolution but rather an eruption. Late in the story, Nashe is alone in the small trailer set up beside the folly, and he is given a small electric keyboard. He has some of his old sheet music salvaged from the trunk of his car, and starts playing. He discovers that pieces written for the harpsichord sound best on the keyboard, as it has poor volume control. He focuses in on a famous piece by French composer Couperin called "Les Barricades Mystérieuses". He seems to recall that no one was certain what barricades the title refers to. To him there is something compelling about the way the piece builds momentum then slackens but refuses to resolve its internal tensions. Like Mitchell in Cloud Atlas, Auster uses an embedded musical work to wink at rather than explicate the structure of the work, though in Auster's case it is a reference rather than a product of the fiction itself. I wasn't familiar with Couperin, only enough to know that he was non-fictional. Upon hitting the reference and understanding the importance to the work, I put down the novel and pulled up the Wikipedia page for Couperin, and was listening to a YouTube recording of "Les Barricades Mystérieuses" on a harpsichord within a minute or so4. This sort of referential gratification made me reflective: it would have been entirely impossible when this book was written just over 20 years ago. I could have perhaps found a book or a recording within a couple of days at the library, but only perhaps. Google, Wikipedia and YouTube would seem to render all text into hypertext — while I couldn't click the reference in this hardcover, I was nevertheless satisfied nearly as quickly with text, images and audio. Does this immediate satisfaction deflate some of the mystery of the work? Does it make a deeper understanding of the work more accessible to the musically obtuse5? Or does it distract from the primary work by embedding it in nest of links? To be fair, I was led to this compelling novel by following links, so perhaps it is only appropriate than links should lead me back out again. If you crave a traditional plot or firm resolutions, then this book isn't a good match; it is a novel but not precisely a story. However, the skillful structure and propulsion of the narrative made this effective and affecting. The author's almost reckless manipulation of tension and his persistently eerie tone made this hard to put down. Full disclosure: My library copy had the first edition cover, not pictured. The first edition cover is possibly the ugliest book cover I have ever seen, and I can't bring myself to post it or even link to it here. My recent review of Ghostwritten by David Mitchell. I followed up this novel by reading Auster's New York Trilogy, which in an ideal world I would review soon. A version for harpsichord and discussion of the name "Les Barricades Mystérieuses". My neighbour owns a harpsichord, and was intimately familiar with the piece; he would have resolved the reference without digital means. The connecting power doesn't give me something universally impossible, but rather makes something universally possible.